The MiSeq personal sequencing system delivers the fastest time to answer, a revolutionary workflow, and the widest breadth of sequencing applications, all in a compact and economical instrument. For results in hours, not days, MiSeq uses TruSeq, Illumina’s reversible terminator-based sequencing by synthesis chemistry in combination with innovative engineering. Perform standard experiments such as amplicon sequencing, clone checking and small genome sequencing with enhanced performance, more quickly, and cost-effectively compared to capillary electrophoresis (CE) sequencing. Gain access to powerful next-generation sequencing applications such as highly multiplexed PCR amplicon sequencing, targeted resequencing, ChIP-Seq, small RNA sequencing, and more. 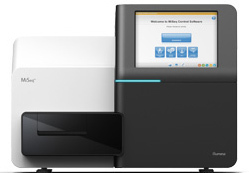 For current next-generation sequencing users, complete smaller projects in a fraction of time and cost using the MiSeq system.